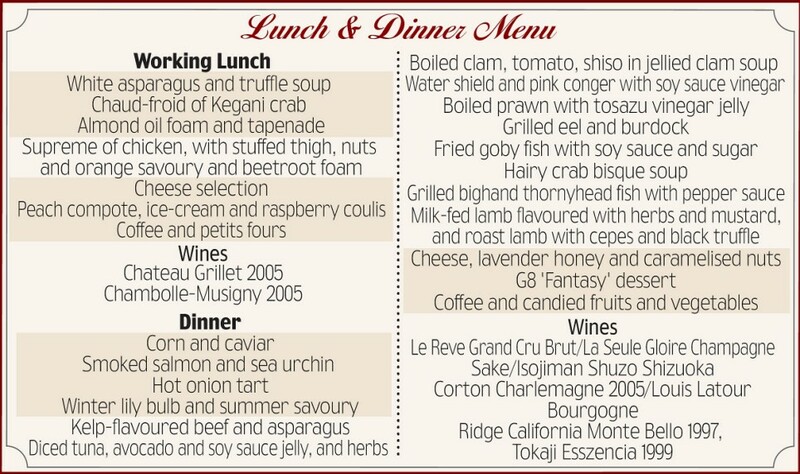 Dining on such unpronounceables as Boiled Prawn with Tosazu Vinegar Jelly, Chaud-Froid of Kegani Crab, and Grilled Bighand Thornyhead Fish with Pepper Sauce—all prepared by Japanese Michelin Star chef Katsuhiro Nakamura and washed down with a fine assortment of wines and sakes—the G8 leaders congregating at the ultra-exclusive Windsor Hotel packed their stomachs, while, somewhere on Earth, a human being died of hunger every 3.6 seconds. Dominic Nutt, of the charity Save the Children, did not approve. ‘It is deeply hypocritical that they should be lavishing course after course on world leaders when there is a food crisis and millions cannot afford a decent meal,’ he said. ‘If the G8 wants to betray the hopes of a generation of children, it is going the right way about it.